Based on some feedback, we’re decided to change the time-slot for GMB (Gold Medal Bodies) Gymnastics classes to make them convenient. Beginning February 7th, the class moves to Saturday mornings at 9am. Our amazing coach Kirsty Grosart will be helping you with mobility, bodyweight and gymnastics skills to help you drastically improve what your body is capable of. You may already know Kirsty as a StrengthBox coach, but she’s also a certified GMB trainer, a level 2 gymnastics coach and an Agatsu level 2 instructor. She loves to teach people bodyweight skills while helping them learn some cool “tricks”. You will be able to use your current StrengthBox package (Unlimited or Flex Pack) to sign into these Saturday morning classes, or you can drop-in for $20. Not sure what the class will be like, or what you’ll be capable of? It’s our job to help you discover what is possible…so we hope you’ll join us each Saturday morning and find out! The goal is to provide you with some variety to complement our regular programming, while having fun! 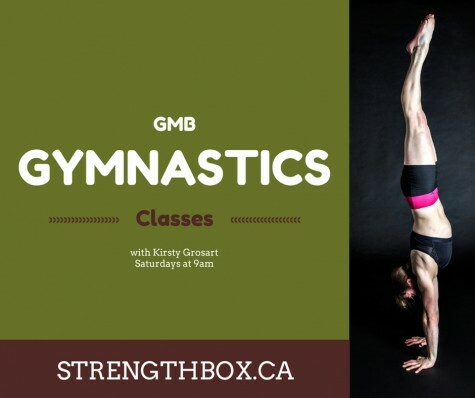 You can register for these classes on Saturdays at 9am on the StrengthBox website.